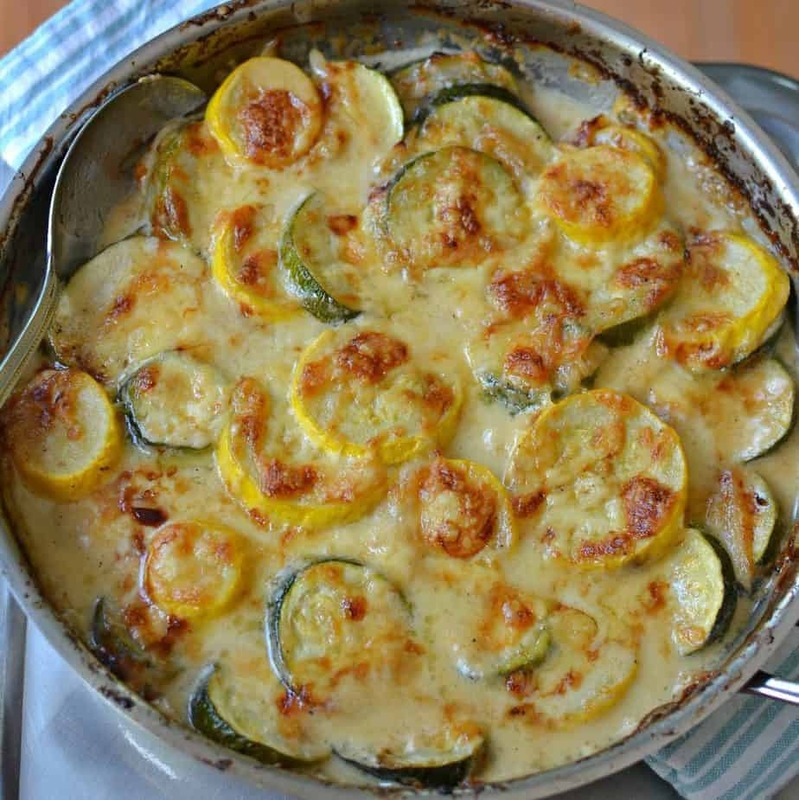 ZUCCHINI GRATIN WITH YELLOW SQUASH IS A DELICIOUS SIDE DISH THAT IS EASY AND QUICK TO PREPARE. IT WILL MAKE A SUMMER SQUASH LOVER OUT OF YOU! Summer is in full force here and with it comes lots of fresh zucchini and yellow squash. Even if you don’t grow it the season brings such an abundance that the market price drops on it consequently making this dish even more desirable. 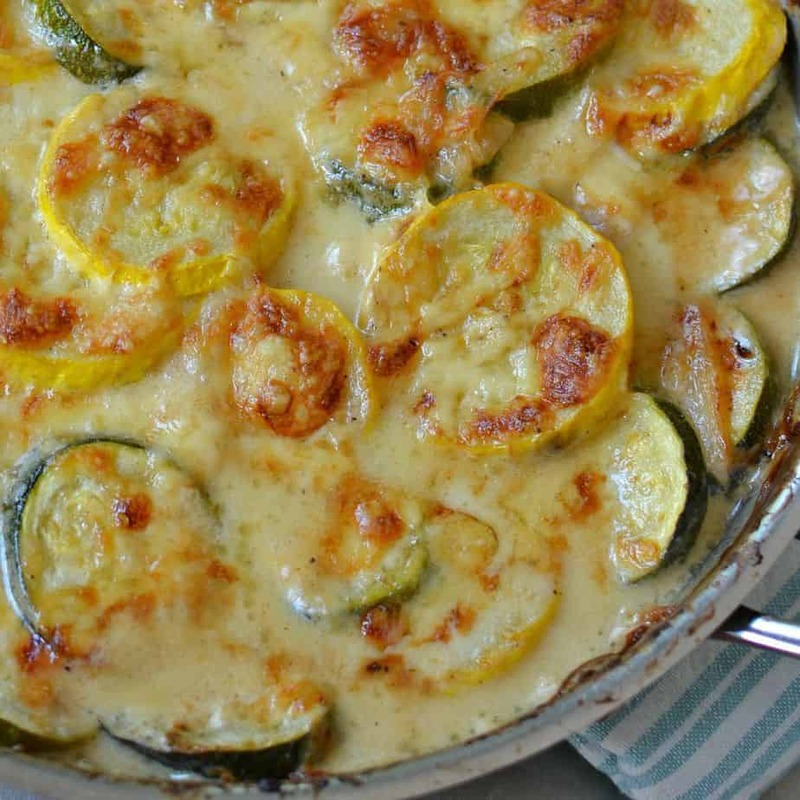 This delectable Zucchini Gratin takes about 15 minutes of your devoted time and then it is in the oven for an additional 15-20 minutes making it very doable for a weeknight meal. 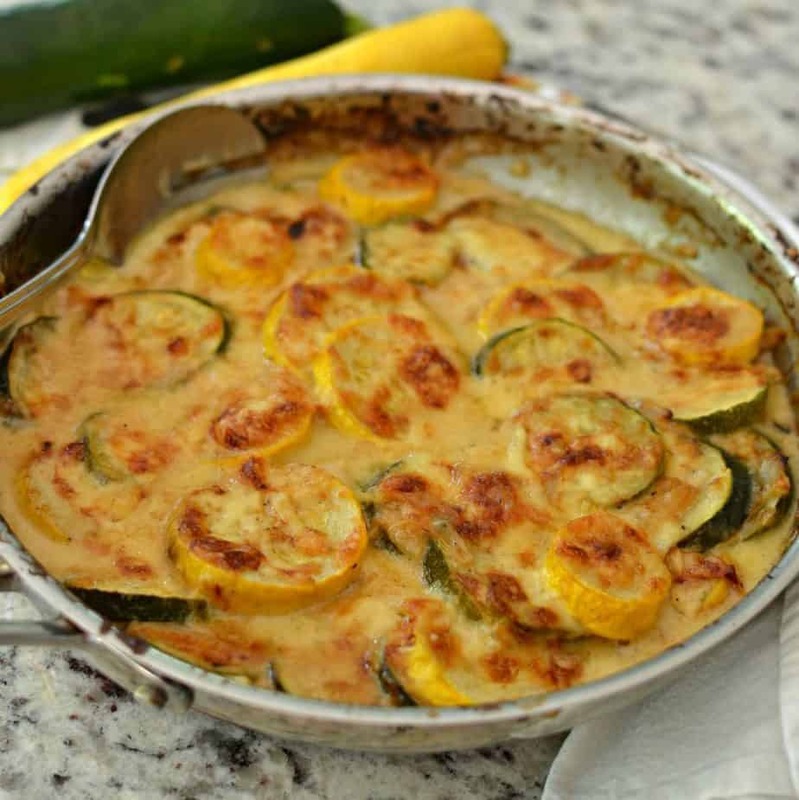 This recipe will bring out a passion for zucchini and squash that you never knew you had! Zucchini is a summer squash. It is native to central America and Mexico but it is grown throughout the United States during the warm summer months. While you may think of zucchini as a vegetable it is actually a fruit. Zucchini and yellow squash are low in calories with a low glycemic index. Both squashes are a good source of vitamins A and C, fiber and potassium and they make a great zucchini gratin. HOW TO MAKE ZUCCHINI GRATIN! This delectable recipe could not be any easier! Using an ovenproof skillet melt the butter and add the onion. Saute until the onion is slightly soft and browned on the edges. Add the garlic and cook one more minute. Add cream and simmer until bubbly and slightly thickened. Slowly stir in Parmesan then add zucchini and yellow squash and cook for a few more minutes. Sprinkle with Gouda and bake for 15-20 minutes. So easy and so delicious. It is amazing what happens to a veggie after you bake it in a bath of cream and cheese. Oh yeah don’t forget to give credit to the garlic! As if that isn’t enough there is a blanket of smoked gouda on the top to create the most delectable squash dish ever! MORE ZUCCHINI RECIPES YOU WILL LOVE! This post was originally published September 7, 2015 and was republished July 16, 2018. Melt butter in oven proof skillet over medium heat. Add onion and cook until the edges start to brown approximately 5 minutes. Add garlic and cook for additional 1 minute. Add cream and simmer until bubbly and starting to thicken. Slowly stir in parmesan. 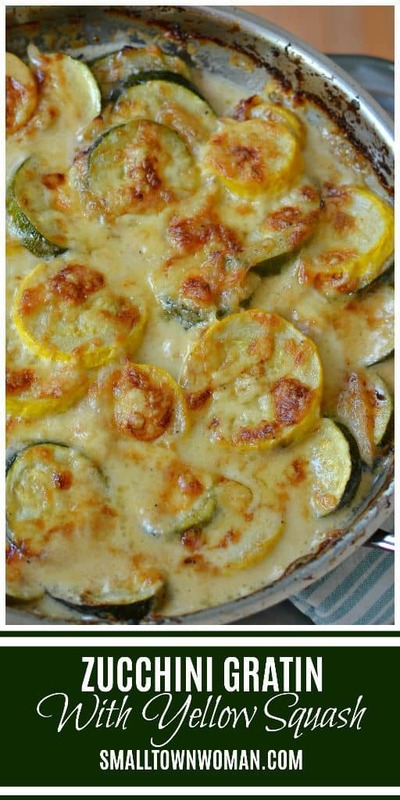 Add zucchini and yellow squash and cook an additional 4-5 minutes. Sprinkle with smoked gouda and bake in the oven for 15-20 minutes or until cheese is golden brown. The zucchini that I used were on the smaller side. Some of the late summer zucchini I see coming in are much larger. For those I would double the cream and the Parmesan. The large zucchini are sometimes a little tougher and may require additional simmering and/or baking time. you never mention in directions when to add garlic?? Thanks for the heads up! I appreciate it! It has been corrected! Happy cooking! It says to cook onions for 5min. Then add garlic and cook another one min. Thanks for the recipe! I had just purchased some yellow squash & zucchini on Sunday, and I am excited to try this! I’ll let you know how it turns out! I am pairing it with meatballs & a spinach/romaine salad for my family this evening. Do you have the nutrition info for this? I am sorry Carrie I have not added nutritional information yet. Maybe I can get that taken care of soon. I just looked. Second ingredient listed – 1/2 onion thinly sliced. I am going to try this tomorrow, don’t have time to go to the grocery store to get gouda cheese, I will try it with cheddar and Monterrey jack cheese and see how that turns out. This is a simple recipe and I will probably make it all summer long! Thanks for sharing this! You are most welcome. Let us know how the cheddar and Monterey Jack cheese turns out!!! well, this is delicious! thanks for the recipe! I make a dish very similar to this but it has sliced tomatoes on top of the squash/zucchini. If you like tomatoes, it’s delicious! Especially home grown tomatoes in the summer! Sounds delicious. Home grown tomatoes are the best!! Yes, that sounds so good! ? on top and I have fresh from the stands, someone garden! Yummy and Thank you for the idea. ??? This was delicious!! We paired it with salmon and it was a winning combo. I will definitely make this again and again over the summer! I didn’t have gouda (though omg, this would be phenomenal with smoked gouda!) so I used fresh parmesan–I actually DID have it on hand–and topped it with sharp cheddar. There were NO leftovers! Thanks so much for a winning recipe! You are so very welcome. I am so glad that you liked it. Thanks for taking the time to leave such a nice complement! Shoot! You’re so welcome! I have to put this out there too: I’m not opposed to spending an hour cooking (I cook most things from scratch), but I have to say that this recipe was SO EASY and quick to put together! The thing that took the longest was browning the onion, but that time was SO WORTH it for the flavor the caramelized onions added to the dish. I didn’t cook the squash and zucchini in the skillet (not to save time, just because I didn’t want mush). I put half of them in the skillet to coat them with the sauce, and poured that on the rest that I’d already layered in my casserole dish and cooked for 20 minutes. It came out perfect to our tastes. And like I said, NO LEFTOVERS–always a good indication of a GREAT recipe! This was the best casserole I have ever made!! New staple at all our holiday get togethers! Oh thank you so much! Long day! I needed this sweet comment this afternoon. Hard to find Gouda cheese here so I used parmesan and asiago. Great recipe. Great choice of substitutions. So glad that you enjoyed it. Thank you! I am going to try this tomorrow, way too hot today to have my oven on 450 degrees. I don’t have smoked gouda either, so 1. The store or 2. I will use any other cheese I have on hand. I will revisit this after but wanted to say this Looks like a fun recipe to try. I get my zucchini and summer squash at Costco, never mind what’s growing in my gardens, they’re just about ready now. Another fun recipe I make is the zucchini nacho recipe I found on the internet. The spicy one with roundscut half inch wide. I have been doing Low Carb since Feb. So I am always looking for new recipes. Thank You. You are most welcome. I will have to check around for the zucchini nacho recipe. It sounds delicious. Thanks for the heads up!! Hi. If you have minced garlic in a jar, how much would you use? Thanks. I think Patricia means that it is difficult to measure garlic in cloves when it is already minced, and an amount in tablespoons/etc would be more straightforward for that. I used 1 and a half tablespoons of minced garlic from the jar and it worked fine! Such a great recipe. I’m always looking for new ways to Cook squash and this is definitely a keeper. and Iran keto friendly. Win win. THanks for sharing! This sounds absolutely amazing! 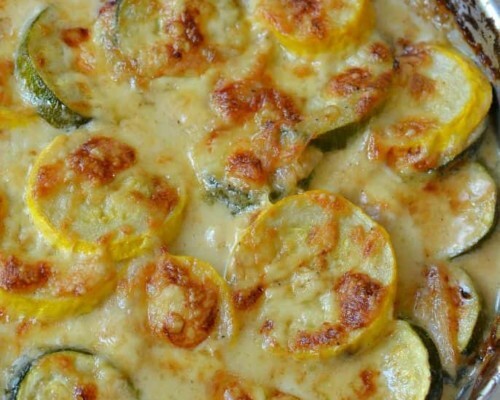 The only way I can get my kids to eat Zucchini or Yellow Squash is to cover it in cheese. I love addition of smoked gouda. That just sends it over the top! Yum! Thanks so much. I love this dish! Glad that kids like it too!! I refer to myself as s food snob. This dish was incredible!! I bought a high quality smoked Gouda which I think is very important. I made this dish for a ladies group pot luck. I thought they were going to lick the casserole clean!! Thank you so very much for elevating a basic, easy to make recipe and making it something truly special! I am so glad that they liked it. Thanks so much for writing such a sweet complement. It has made my morning!! I consider myself a little bit of a food snob too…just a little bit!! Made this tonight in my new iron skillet but with half-and-half and cheddar (all I had on hand) and it was delicious! So simple, not mushy, perfect balance of vege and cheese. I’ve been looking for a recipe like this for a long time. Thank you! By the way, I posted it on Insta but wasn’t sure your handle to give you credit (so I used your website). Thanks so much Carolyn. Your kind actions and words mean so much to me! So glad that you liked it! This recipe sounds fabulous. I have a question – can I assemble it tonight and bake it tomorrow? Will it make it too mushy? Thank you in advance. Yes I think it might affect it although I have not tried that. If you try that please let use know how it turned out! I am so excited to make this tonight only I am adding fresh mushrooms, and tomatoes/bacon bits on top. Thank you for sharing. Sounds delicious! You are most welcome. I am going to try bacon bits on it the next time I cook it! Yummy!! Want to make this tonight,but don’t have heavy cream right now,have regular milk and canned cream, would one work you think? Or just hold off til grocery day..thank you. Sorry but I would hold off till grocery day. Made this today with a couple of changes. Didn’t have cream or gouda cheese. Used sour cream and a three cheese blend, turned out delicious. Awesome! Glad it turned out and that you like it! Linda mentions a mixture of Sour Cream and a three-cheese-blend, but what proportions would be appropriate? Hope not a dumb question, ha ha!!? Sounds like a fantastic, easy, not time-consuming recipe, Beth Pierce; I typically write most of my own recipes; thanks mucho for sharing this beauty!!!!!??? You are most welcome Roxanne. I am hoping Linda responds. I will try to check back a bit later and see if she did. Hi and thank you, Beth. I’m just starting out, and heading to the supermarket after doing some research. I’m working on potion control and live on my own. Would you say this recipe provides 2 portions assuming a palm-sized protein and maybe salad paired with it? Yes I would say that. Please use small zucchini and squash. Some of the summer garden zucchini can grow really big and I need to make some notes on the recipe for these adjustments. I made this for dinner tonight and the flavor is really good. I don’t think the ingredients are enough for two squash. I had to double the cream and parm and it still didn’t cover the squash. And I cooked them according to the time and the squash was still hard. I would probably boil the squash first and triple or quadruple the cream mixture or cut down on the amount of squash the recipe calls for. I will def be making it again but with my own measurements. Thanks. Hey Robin thanks for the heads up. I am going to make some notes on that recipe this morning as there is a vast difference in the size of zucchini and the ones I used were small. My neighbor bought me some yesterday that were twice that size. Thanks so much Diane. Caramelized onions and jalapenos sound delicious!! Can I use 2% milk instead of cream? Do not have it on hand and want to make it tonight. Sorry Debbie but for this one you really need cream.